The fastest 200 MBps Wi-Fi! All day breakfast/coffee/tea. Fully air conditioned in the common areas and dorm rooms as the weather is warm here in Singapore. Whether you are coming to Singapore for a short visit/ VISA run or stopping by before going on to Australia/ Malaysia/ Bali, our cosy hostel is a great place to meet other travellers. All day free breakfast includes bread/ nutella / peanut butter jams and coffee. Our 24 hrs free flow of Nutella, Peanut Butter, Jams, Coffee, Tea, Wholemeal & White bread are worth more than our daily bed rates. We are a newly opened hostel that caters to budget travellers that want a nice quiet place to stay yet conveniently located to tourist attractions and the city. Our hostel is brand new and you can be assured of staying in a nice environment. Coral Hostel is strictly smoke-free. 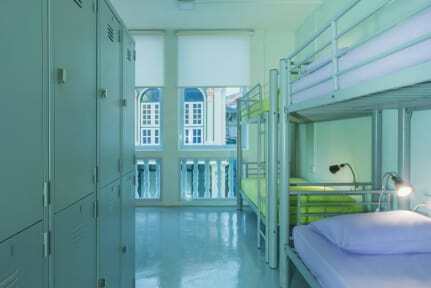 We offer 2 types of rooms, mixed dorm and ladies only dorm. Our rooms are all air conditioned and we feature single bunk beds for comfort. Fresh linens are provided to every new guest to ensure a clean environment. Each bed has an individual power point. We also provide nice clean bathrooms with hot water. 6. Age restriction: do not accept children below 10, seniors above 50. I dont remember the name but lady on the reception was just lovely! The staff, Hector and crew, were so lovely! The space is small but to be expected in Singapore. Great value for the price paid. The free all day Breakfast really helped with my budget!! 10 minutes walk to the underground. Rooms and bathrooms were always clean! The room I stayed in didn’t have windows so unfortunately it smelled a little musty with the mix of all the travellers in the room but other than that, it was a great stay! Good value and location. Right near Arab Street, 15 minute walk from Little India, 30 minute walk from Marina Bay Sand and Gardens by the Bay, 30 minute train ride from Botanic Gardens, 25 minute bus ride from Orchard Road. Staff is pleasant. No real common area to hang out. There's only a keycard for the hostel entrance which is only locked at night, so pretty much anyone could walk in off the street and into any room during the day. Free toast & spreads are fine, but no kaya?! Hostel was decent to stay for one night for cheap. Bathrooms were probably the dirtiest part of Singapore, but still not the worst I've seen. Staff was friendly.